For a limited time, receive a FREE 3M Quick Release Adaptor 05752 with your purchase of the 3M Variable Speed Rotary Polisher! Use 3M double-sided pads with this adapter. Retail value $49.99. The perfect balance of power and performance. The 3M Electric Variable Speed Rotary Polisher balances speed and power with operator comfort. Remove scratches, swirls, oxidation and more with precision and control. The 3M Electric Variable Speed Rotary Polisher has a powerful 11 amp motor with 37.5% more power than 8 amp polishers. Superior construction and user-friendly features make the 3M Electric Variable Speed Rotary Polisher a true professional grade polisher. The 3M Electric Variable Speed Rotary Polisher is a paint-correcting machine! It's built for fast, effective removal of paint imperfections with the 11 amp motor and operating speeds of 1,000 - 3,000 rpm. The electronic variable speed control maintains speed and power even under load. The variable speed control trigger allows the operator to vary the speed below the selected maximum speed for greater control over polishing speed. Work at a slow speed for general polishing or speed it up for paint correction. A heavy duty trigger lock allows you to lock in your desired speed. Set the maximum speed between 1000-3000 rpm. 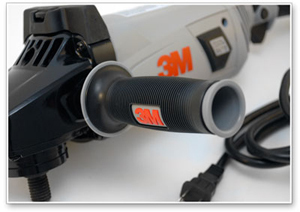 To make the 3M Electric Variable Speed Rotary Polisher more comfortable to use, 3M gave it an easy-grip flexible side handle that absorbs vibration. This reduces arm fatigue over the course of long detail jobs. There are three support handle positions to suit the job at hand. The polisher weighs just 7.9 lbs. but packs all the power of a much larger machine. 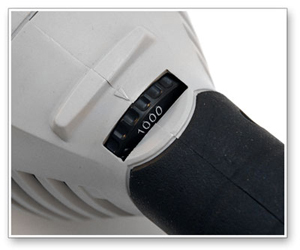 The 3M Rotary Polisher has a movable, soft grip handle. The 3M Electric Variable Speed Rotary Polisher is rugged! It features a magnesium gear housing for greater durability; heat-treated, prevision cut gears; durable, spring steel coil springs to ensure continuous brush contact with commutator, resulting in a long brush life; and a double-insulated 14 gauge, 10 ft. power cord. The cord is abrasion resistant and extremely flexible at a wide range of temperatures. All these features amount to an easier, more controlled polishing experience for you, the operator. The 3M Electric Variable Speed Rotary Polisher makes backing plate changes easy, too. The push button spindle lock features a heavy duty spring so replacing a backing plate is quick. A rubber bumper and nylon locking nut protect the work surface from damage. 3M is a worldwide leader in professional car care solutions and the 3M Electric Variable Speed Rotary Polisher is no exception. Its durable construction, powerful motor, and variable speed control make it an asset to anyone who is serious about creating smooth, flawless auto paint.